I hope you had a good weekend! 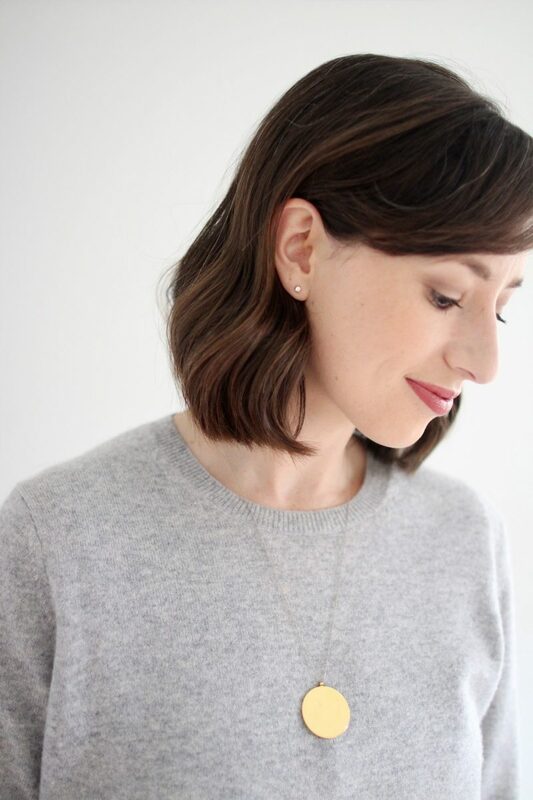 I’ve found myself in reflection mode these days and it was nice to have a weekend (mostly) away from social media and my inbox to let some plans and ideas percolate. During this latest 10×10 Challenge you might have noticed that I was wearing some new earrings with each look. 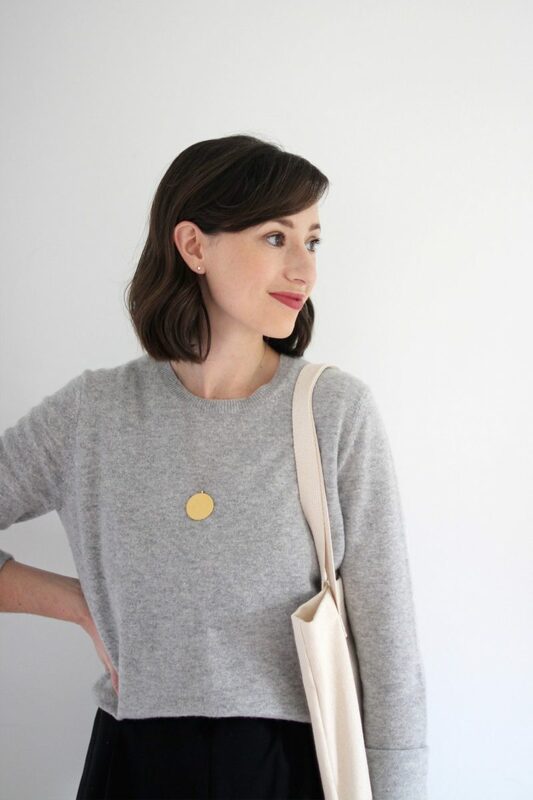 As always, the 10×10 reinforces how critical jewelry and accessory options can be and this time was no exception. 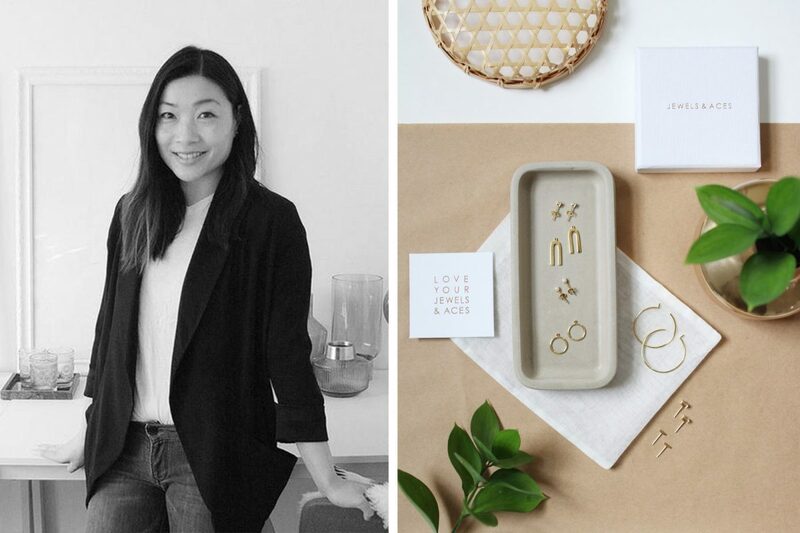 This brings me to today’s featured brand, Jewels & Aces, a Toronto based line of contemporary jewelry founded by the talented, self-taught designer, Grace Wong. 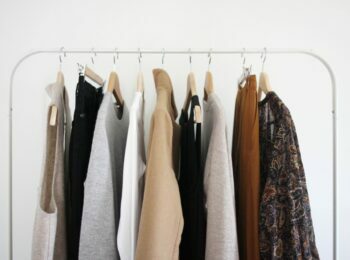 Grace’s approach to her collection was inspired by her experience with a capsule closet. 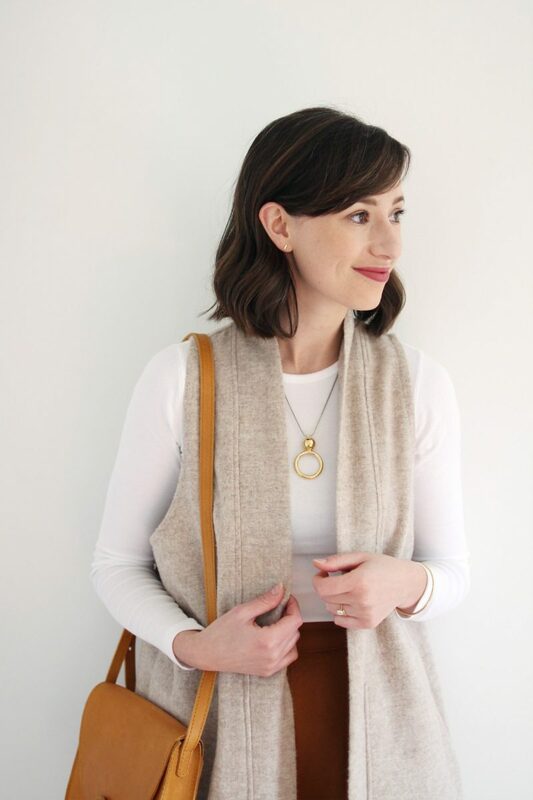 She noticed how having a small selection of versatile, timeless and simple pieces allowed her to best express her personal style. 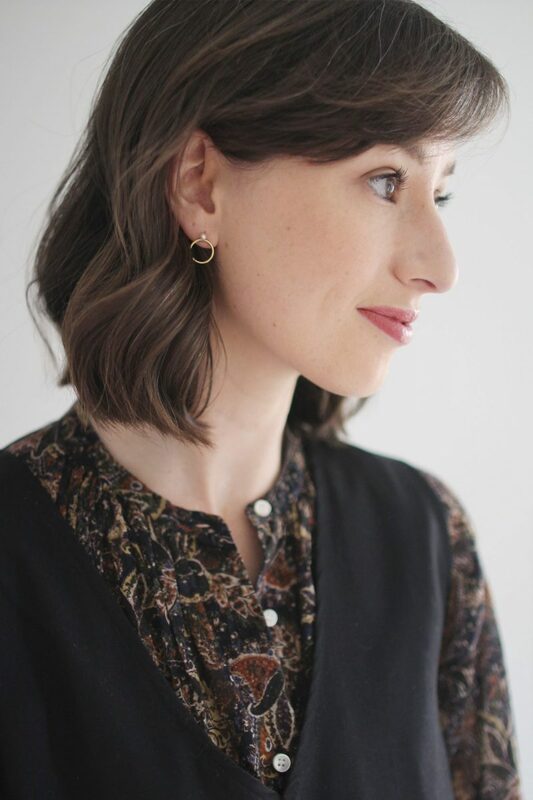 Grace then applied the concept to create a line of thoughtfully designed and responsibly handcrafted earrings that could be mixed, matched and worn on their own to create lots of different looks. The result? 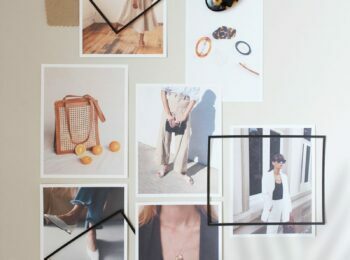 An Earring Capsule collection that offers a range of classic studs and contemporary jackets that can be customized and combined in a multitude of ways to suit the personal style of each wearer. So interesting, right!? More about this line of consciously made jewelry. 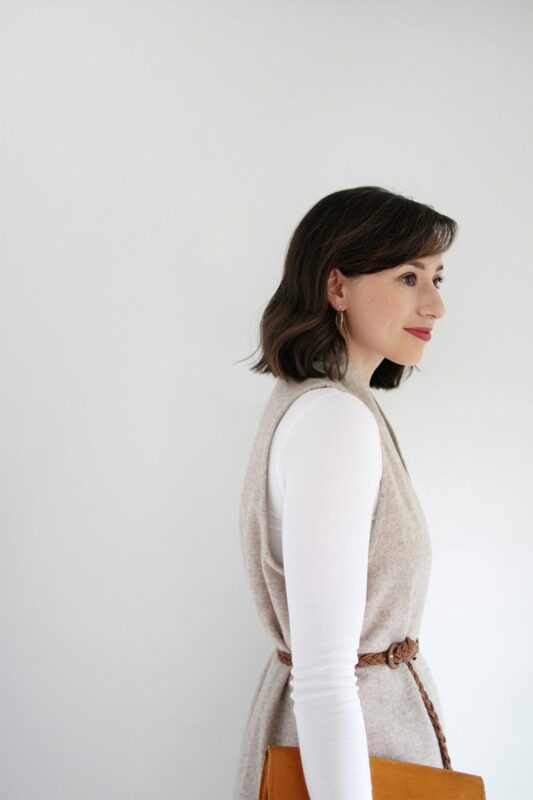 A closer look at all the styles I’ve been wearing. My thoughts on which ones are my favourite to create a capsule with. Where is Jewels & Aces Produced? 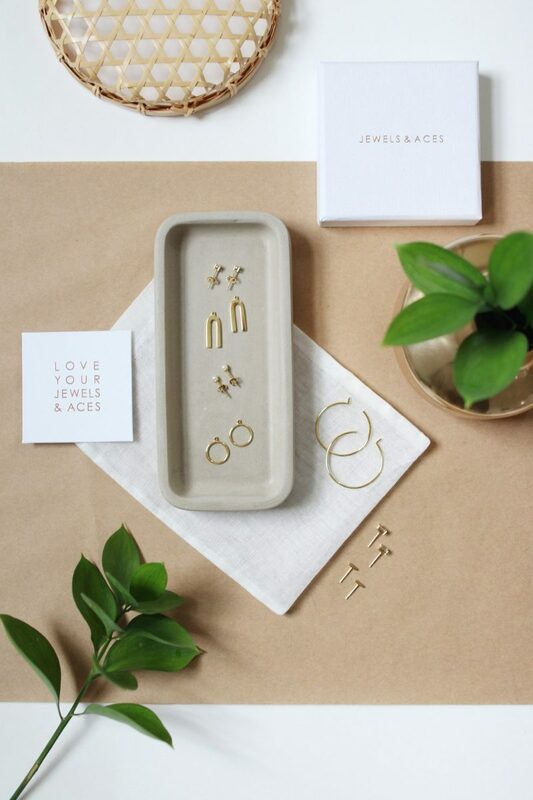 We produce our jewelry (ethically and sustainably) in Shenzhen, China as it’s the fine jewelry capital of China known for skilled craftsmanship, innovation and its progressive green standards. After a global search, we chose to produce there mainly because we could build the most sustainable supply chain (from raw materials like our metal refineries and gem cutters, to our jewelers) reducing transportation and shipping expenses and environmental impact. Each piece is also custom cast rather than made from prefabricated materials so it’s traceable and we can control our quality from start to finish. What are Jewels & Aces pieces made of? 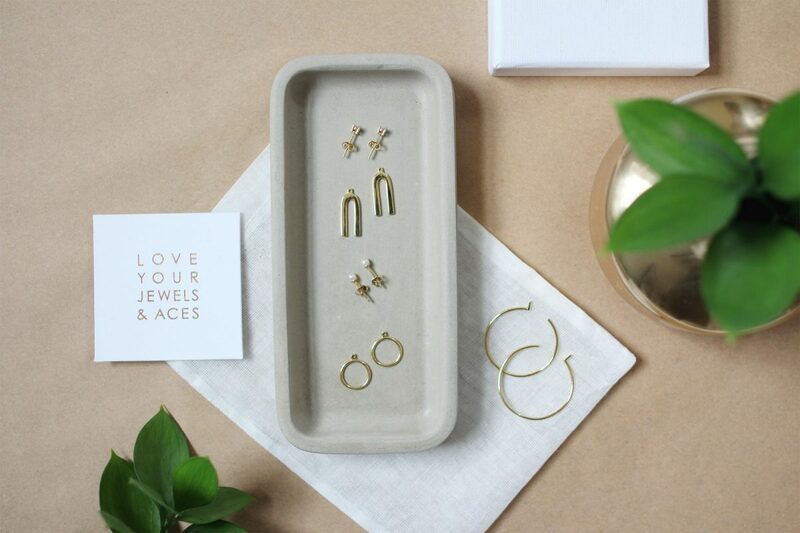 PREMIUM AND RESPONSIBLE GEMS: Jewels & Aces uses lab created stones that are responsible alternatives to mined gems but don’t compromise the sparkle. They are conflict-free since there’s no question about their origination and also without the human and environmental concerns. RECYCLED PRECIOUS METALS: Jewels & Aces is committed to using premium precious metals like 14K gold and sterling silver. Metals are sourced directly from select refineries who produce high-quality metals. 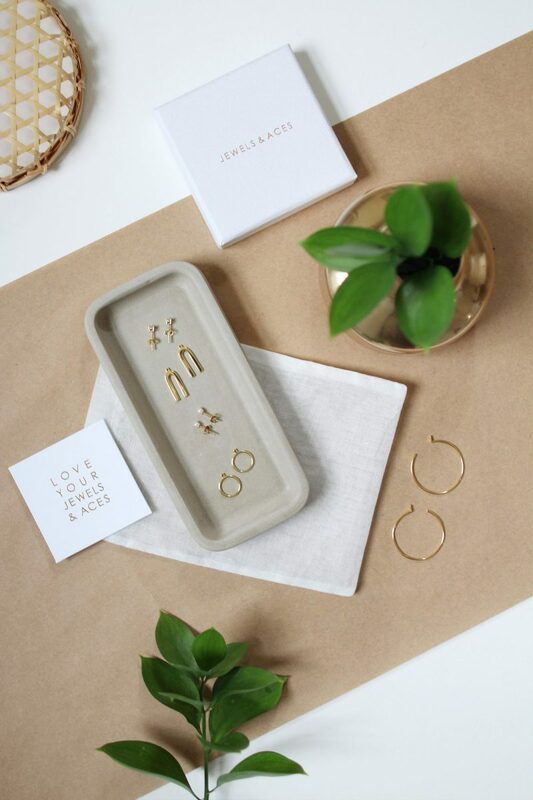 Jewels & Aces’ main refinery uses 100% recycled precious metals and each piece of our jewelry is sustainably cast. Details are noted after each style shown below and you can learn more about the Jewels & Aces approach here. The Jewels & Aces Price Point? Save 10% on any order with ‘STYLEBEE10’ and take $20 Off any stud and jacket combo. Return window is 30-Days but standard restrictions apply. The Jewels & Aces packaging is beautiful and I feel that it really adds to the overall brand experience when you first receive the pieces. It’s the unboxing we all dream of! 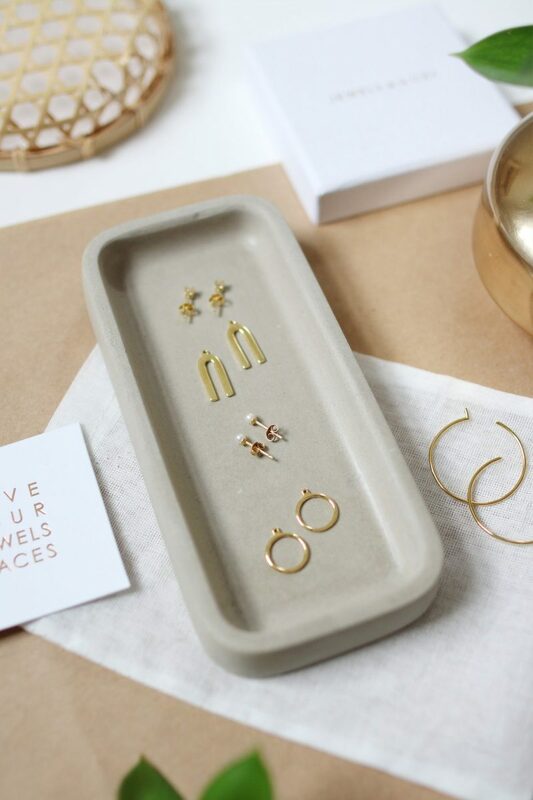 The packaging is made from recycled materials but if you already have a jewelry storage solution and would prefer to keep the packaging minimal, you’ve got that option. 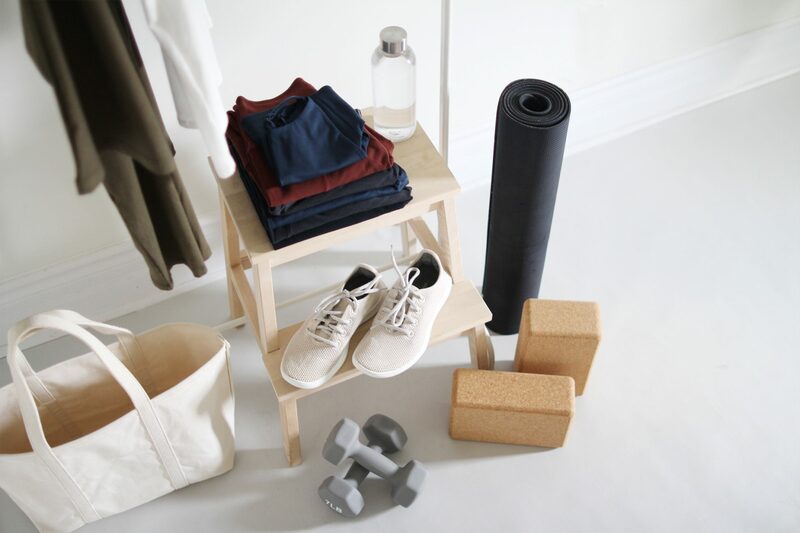 Simply write ‘Minimal Packaging’ in the notes field when you check out and your pieces will arrive in a simple velvet pouch instead of a box. You’ll recognize these looks from the 10×10 but I haven’t yet shared all these photos, plus there’s a closer look at one of my bonus outfits below too. 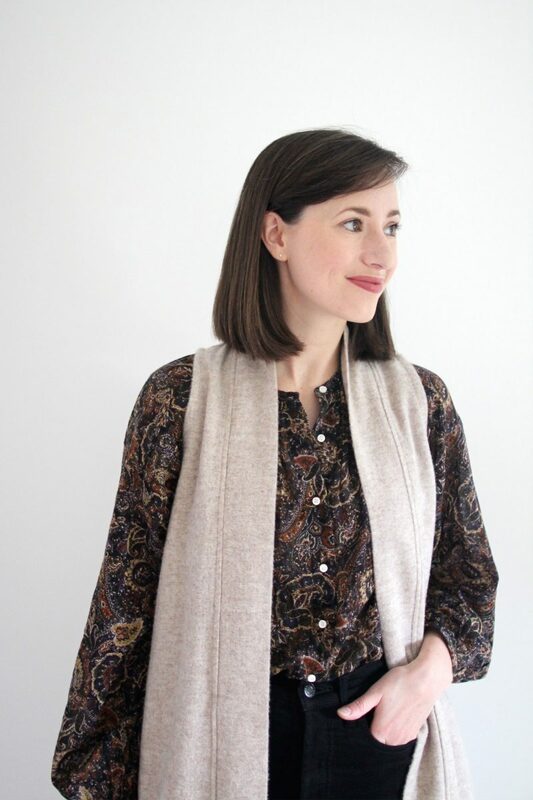 It was so much fun to pick a different item or combo for each outfit throughout the challenge and has continued to be an enjoyable element of getting dressed each day. I’d originally intended to have my second ear-piercing functional again by now but I haven’t managed to get up the nerve for a voluntary needle. 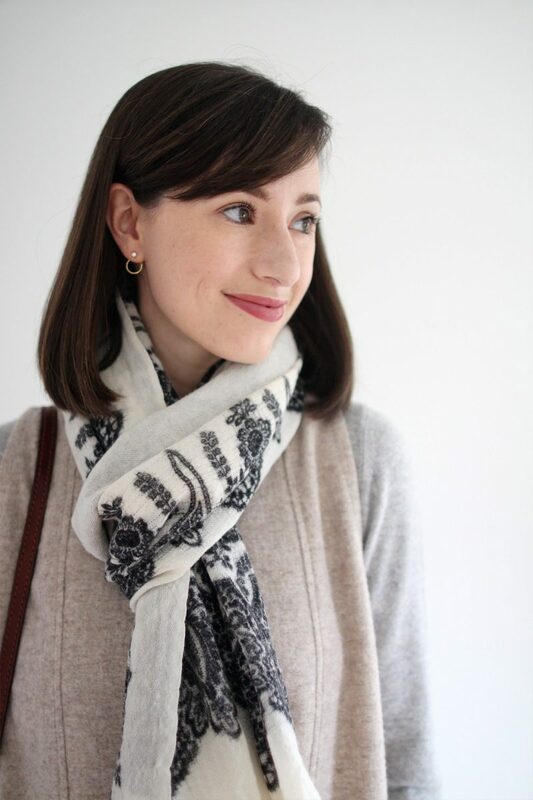 I can only imagine how many more ways I could mix and match these earrings if I had twice the places to wear them and it’s a major incentive to finally follow through. 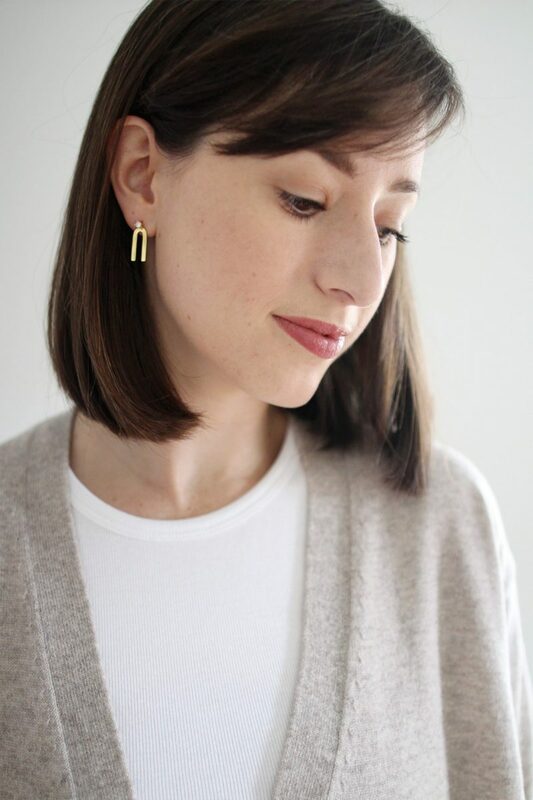 Until then, however, here is a look at the different ways I’ve been wearing Jewels & Aces studs on their own and with a few ear jacket options to mix things up! For all outfit details and links to shop please see this post. I found myself reaching for the petite pearl studs a lot during the 10×10 and more still since it ended. 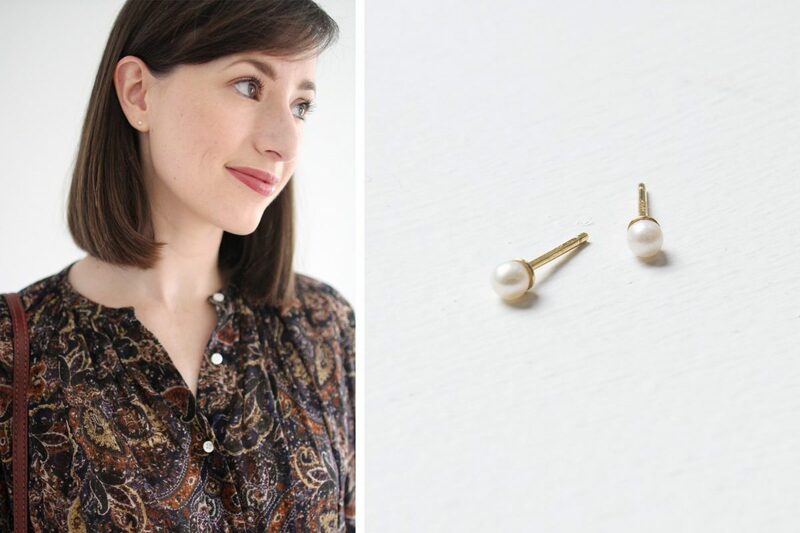 I tend to find more classic pearl studs to be a bit on the large side for my style and they can feel a but stodgy sometimes but these petite freshwater pearls are a perfect example of how scale can have such a profound impact on the end result of a piece of jewelry. 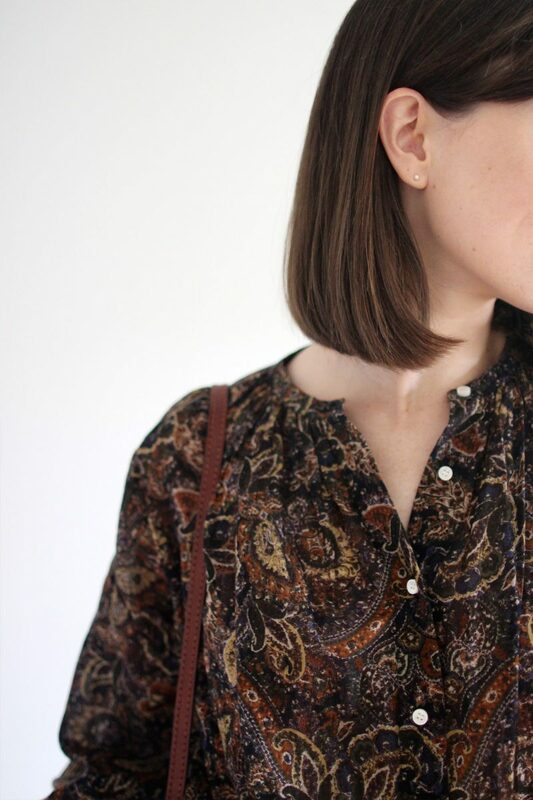 These are so elegant and understated but add just enough polish to any outfit, whether it’s a busy paisley print or a basic tee under a black blazer. Plus, they’re also so light and comfortable that you forget they’re even in. Case and point, I’ve slept with them in several times! 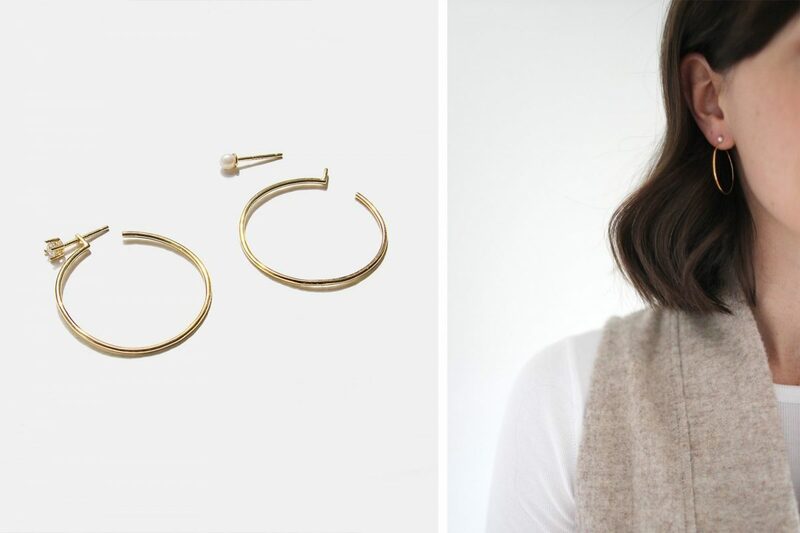 The hoop ear jacket is the largest in size of all the Jewels & Aces capsule styles and it’s a great addition if you want to make more of a statement. I love it tucked behind the pearl stud but they’re just as great with the solitaire stud and would be perfect with the ball studs too. I like turning them around so they attach at the back and leave an opening in front (which is tough to see except in the photo above). 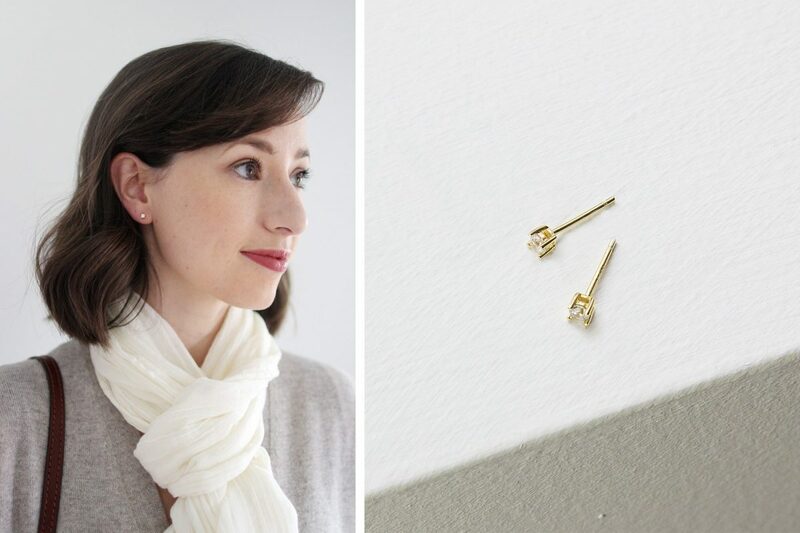 This subtle and unexpected detail is what makes these earrings so fun to play with. 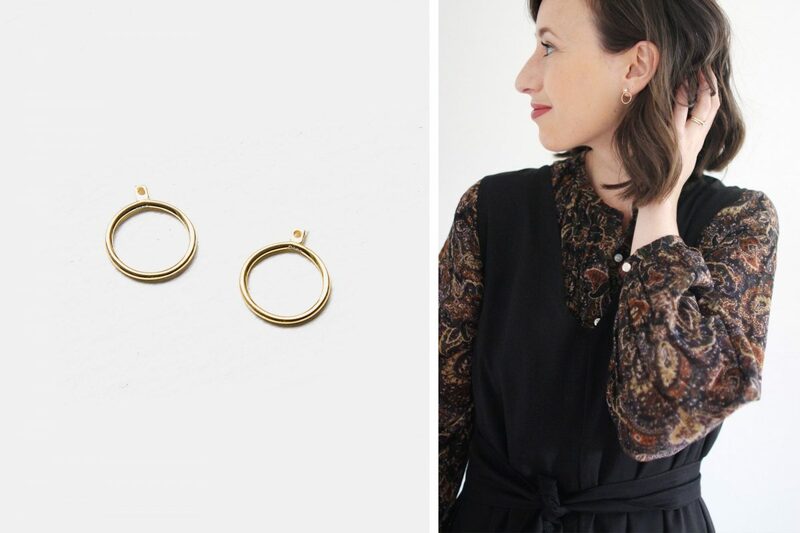 The hoops are very lightweight and the perfect size to be both work and evening out appropriate. I love them paired with a simple outfit that needs just that one little extra to pull everything together. 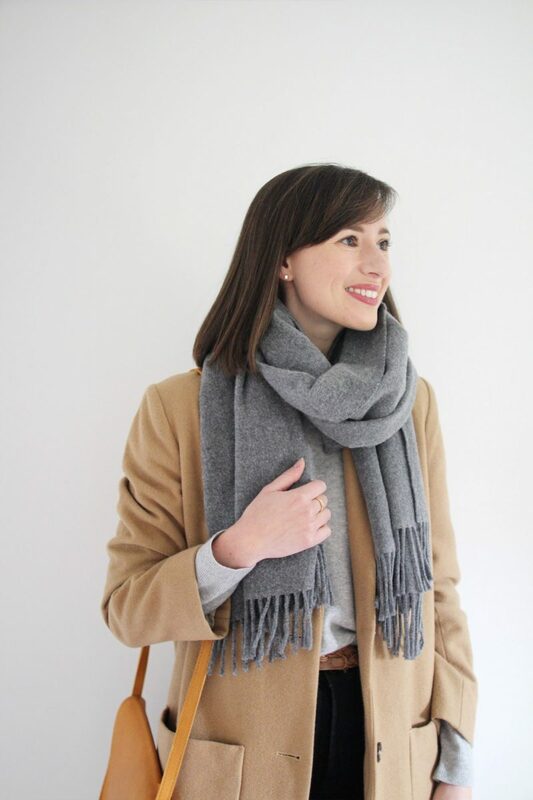 Wear the jacket behind the lobe, in front, layer a few jackets together or opt for an asymmetrical look. Possibly the most timeless out of the whole collection, I’d go so far as to say that the solitaire studs can fit into just about any personal style profile. They really are sparkly and brilliant (as the description promises) and in the shots above you can tell how much impact they have even at their petite size. 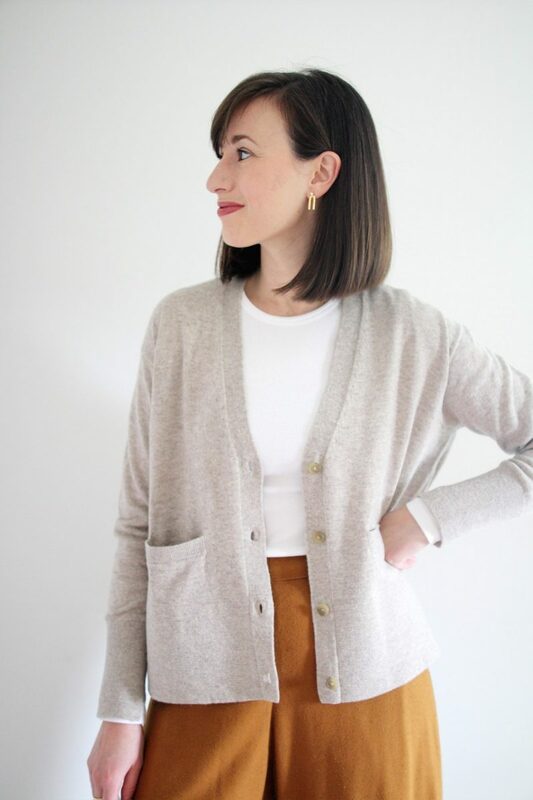 I really like them paired with a cashmere sweater or cardigan for classic look à la Audrey H. You can’t go wrong with these little beauties if you need a new everyday staple to wear. 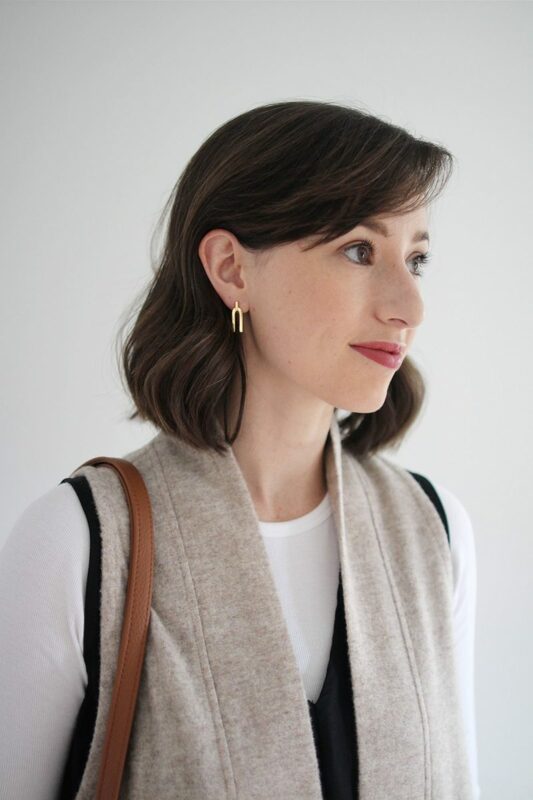 This ear jacket is my favourite one to wear and has garnered many a compliment from my friends, family and shockingly, Dave, who like most husbands, doesn’t always have the keenest eye when it comes to outfit details haha. 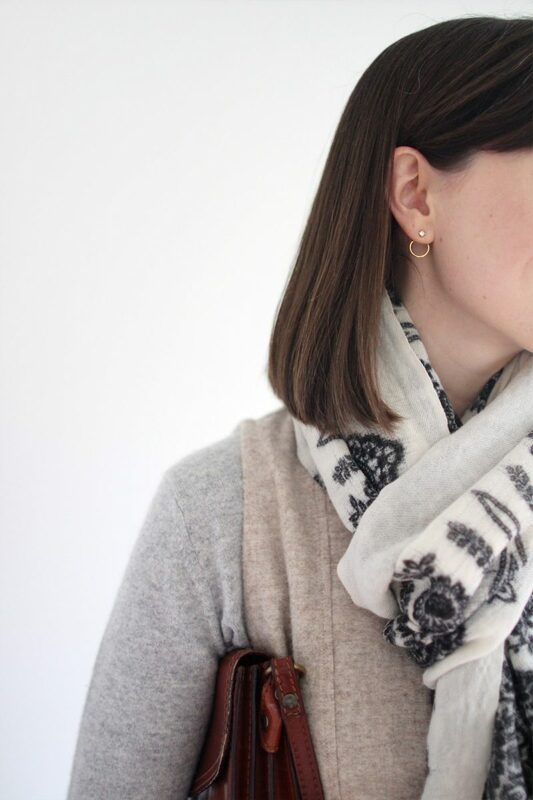 It’s comfy to wear and I personally found it the easiest to style with any stud option. 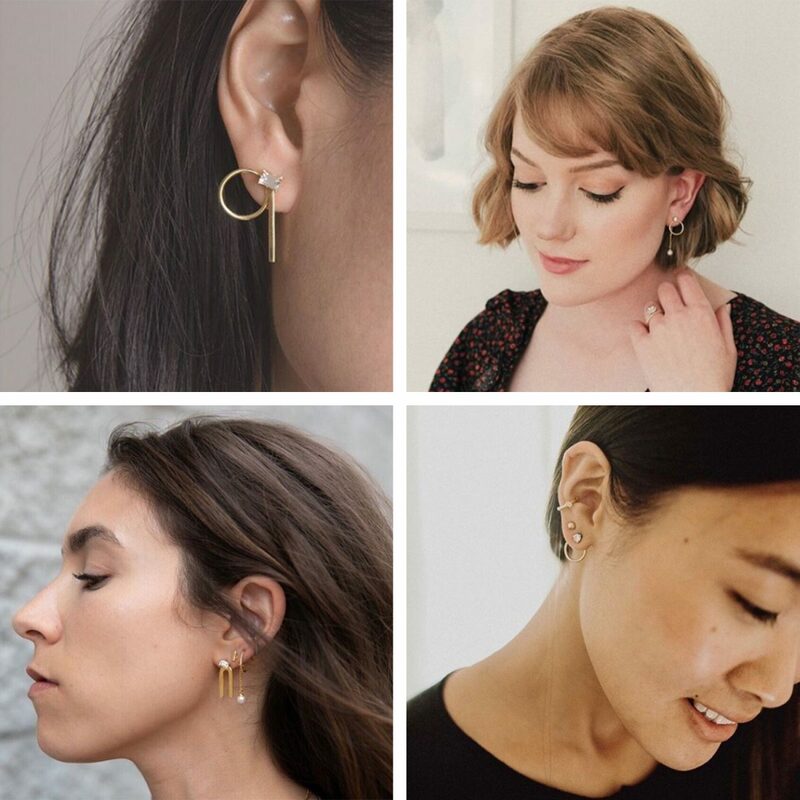 I like to wear it right behind a stud on the front of my ear lobe or at the back for a slightly surprising detail, which I found resulted in the most intrigue from the folks who saw me wearing it this way. Shown both ways in photos above. I am a sucker for an emerald cut for sure and these are a lovely size to show this shape off well. 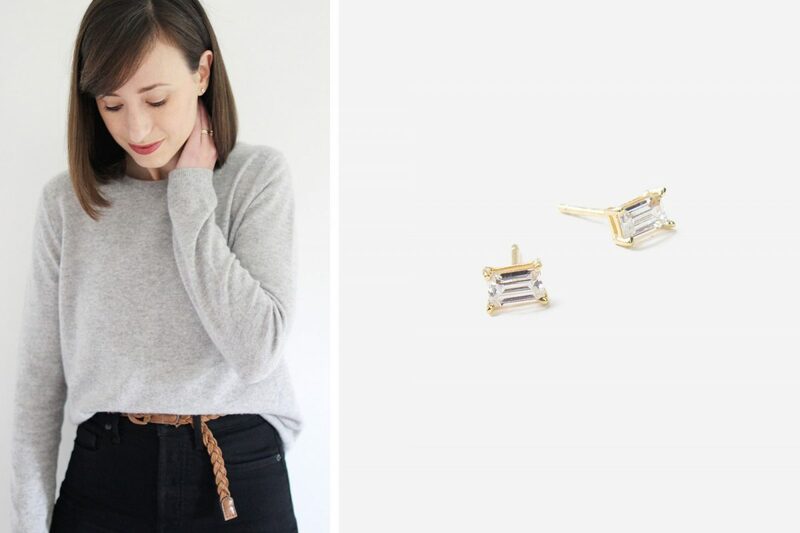 I loved the subtle nod to continuity that occurs when I wear them at the same time as my engagement ring, which is indeed an emerald cut. 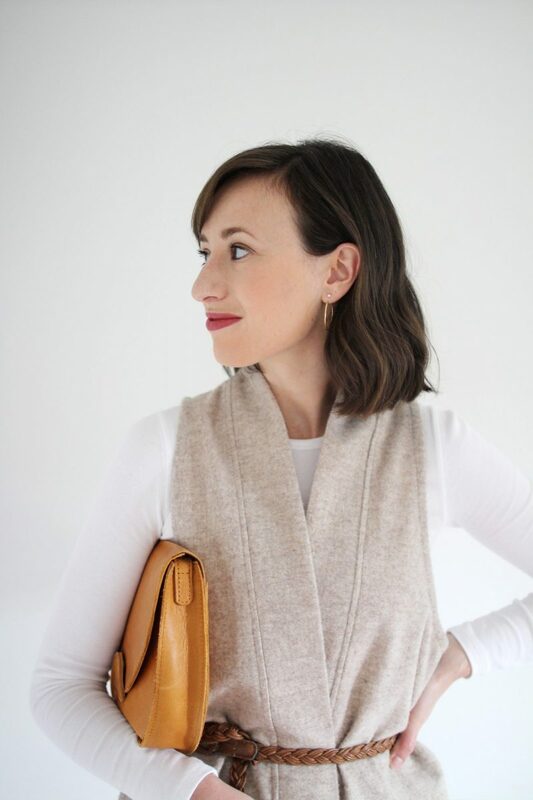 These studs give off a sense of strength, competence and fearlessness to me and I love how they hold their own even next to a giant wool scarf or other bold accessory. These do tend to be slightly less comfortable for sleeping but during the day you won’t even feel them at all. I think they pair well with all the ear jackets but I prefer them best when worn alone. 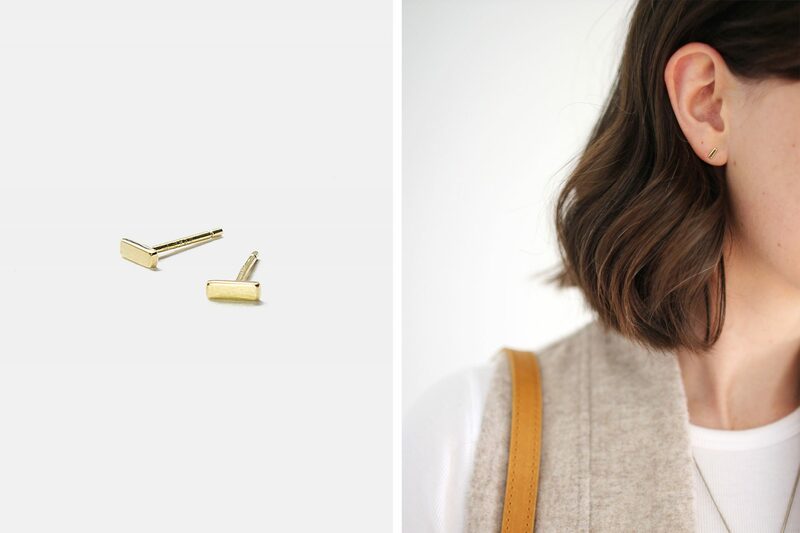 If you’re after an ultra minimal gold stud that works with everything, the stripe studs might be your best bet. They’re just so cute and dainty and I love how they compliment a gold necklace. Once I have my second piercing back these will probably never leave my ears! 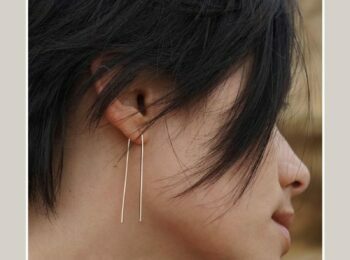 If you’d like to amp up the impact of the stripe stud, the arc ear jacket would be my first suggestion to do just that. I really like how the two combine for a sculptural look that’s low-key but remarkable at the same time. Pair this jacket with any stud though and the results will be exciting! You can see above how I’ve paired them with both the stripe and the solitaire studs above. 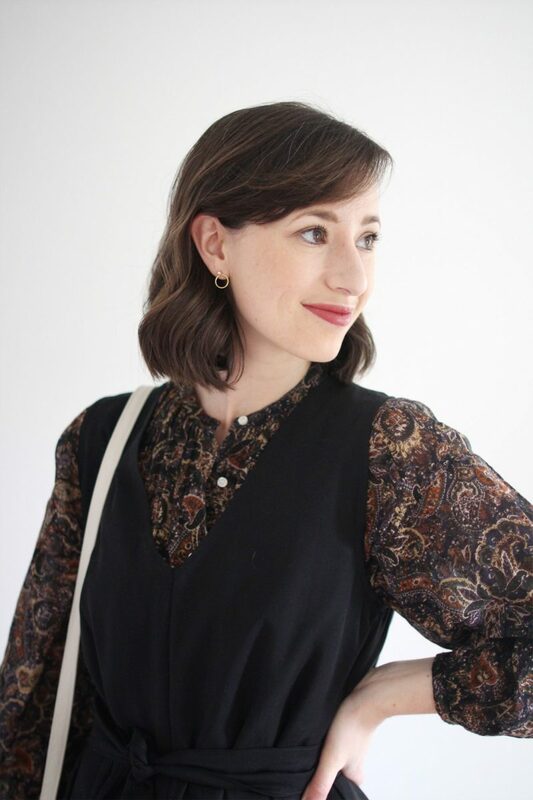 I also think it could be fun to wear them at the back similar to how I wore the circle jacket in the second look, or go asymmetrical with different studs and jackets on each ear. Get a little wild with it! Shown in the concrete dish above. 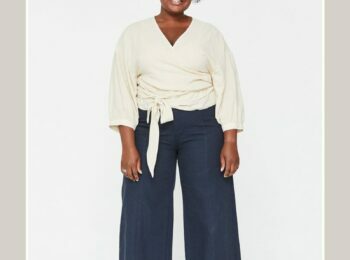 Grace really has created a special collection that has something for everyone with unlimited mixing and matching possibilities! 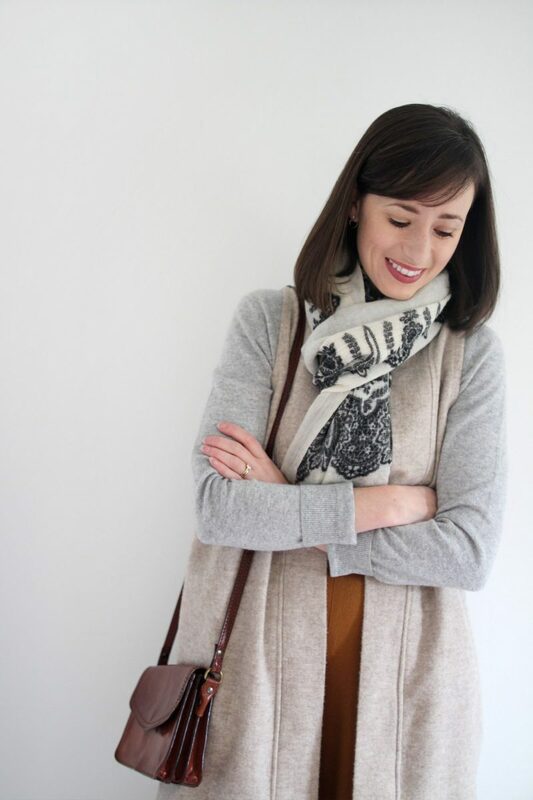 Thanks for tuning in to today’s post! I’d love to know which earing combo (or solo stud option) was your favourite. 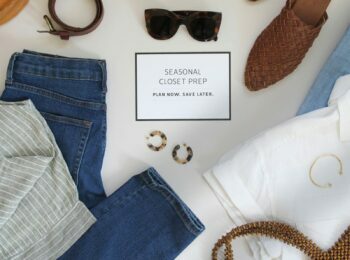 On the topic of extending the capsule closet philosophy further, what areas of your wardrobe or accessories could you see benefitting from this approach? I’ve seen shoes with interchangeable heels but what about hats, bags or other categories? 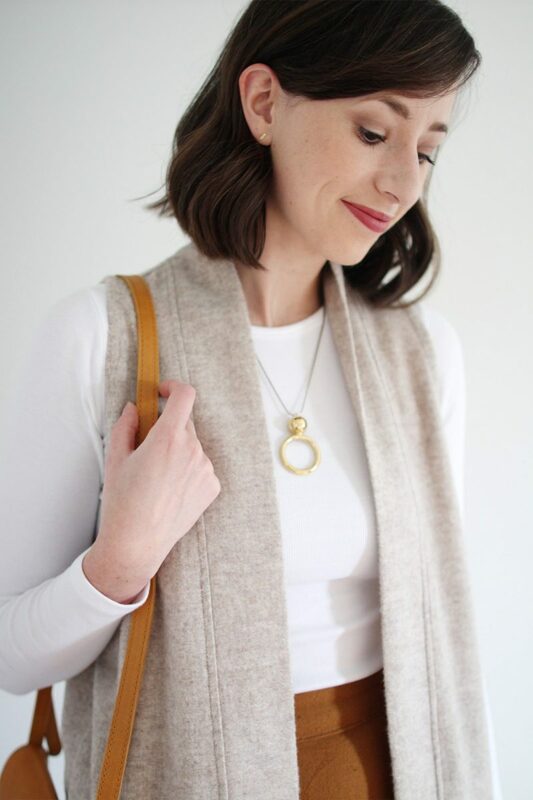 STYLE BEE PARTNERSHIP: This post was produced in partnership with Jewels & Aces, a Canadian based and woman led brand I believe is doing something pretty special! These pieces were sent for me to test and review for this post. While I receive a commission on sales made using the exclusive Style Bee reader code I never recommend brands or items that I am not personally interested in and feel are a worthwhile investment. 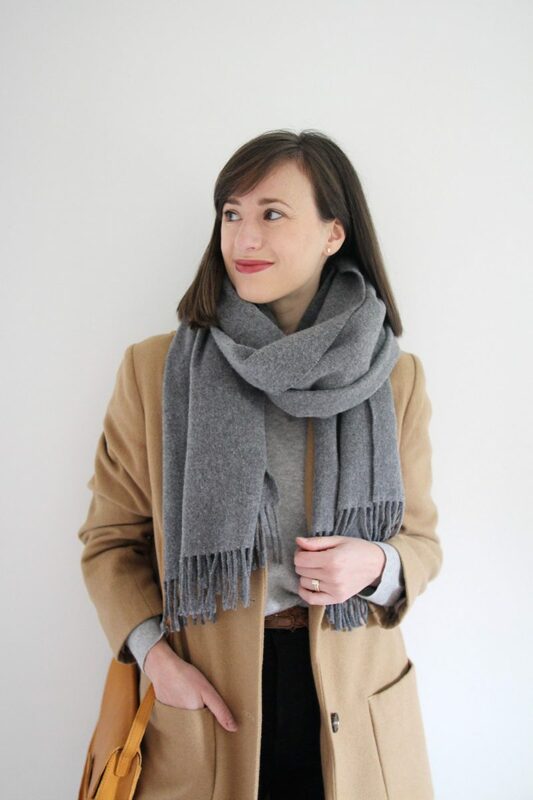 This type of partnership enables me to work with independent brands and helps to support both of our small businesses. All opinions are entirely my own. Thanks for supporting the brands that support Style Bee! Love this idea so so much! I presume that you can mix the jackets with other studs from different brands too? Hi J, Good question! Yes you can definitely mix in studs from your existing collection as well! This is such a great idea! 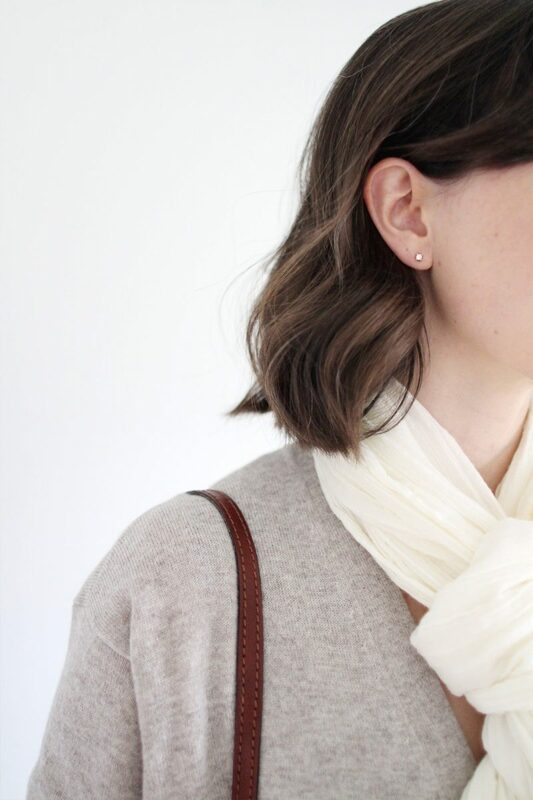 I love the idea of being able to subtly change up your earrings every day with such minimal effort! 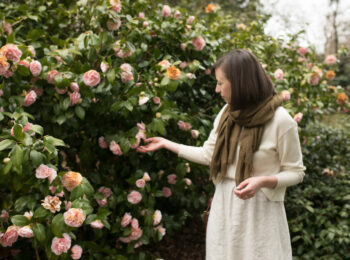 I’ve had my eye on these for a few months – they are simply gorgeous! The one weird thing I’m seeing though, is that pricing is in USD when I click through – except it hasn’t been converted. 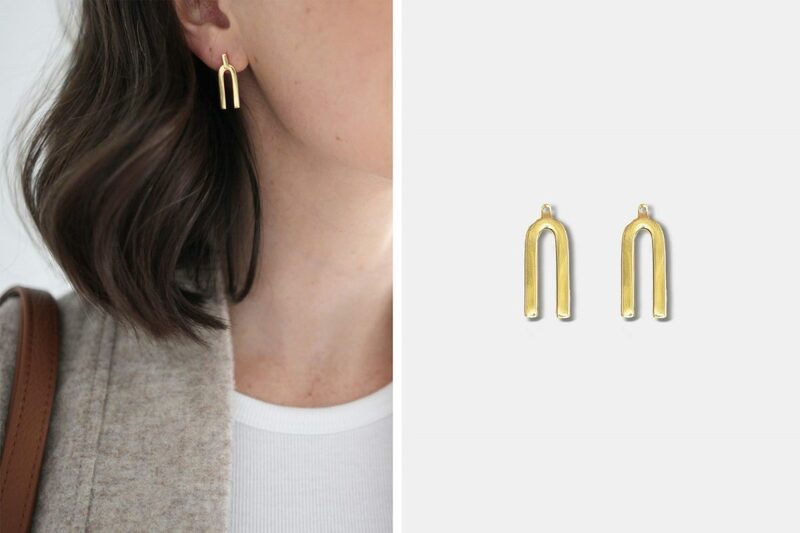 The Arc earrings you linked to are showing as $59 USD (rather than as $59 CAD converting to ~$45 USD – a pretty substantial price difference). Any ideas how to click through for the CAD pricing? Love these! When I was a little girl I did something similar with a baggie of mixed sequins and studs I owned… Appreciate this more grown up version 🙂 Just bought a set – happy to support you and this company. The ear jackets are genius! I love how you can mix & match them with the studs. 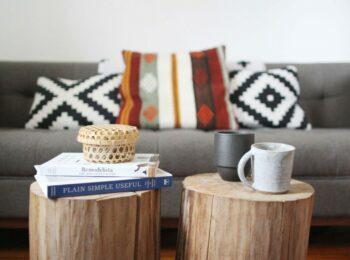 Thanks for introducing such amazing brands on your blog! 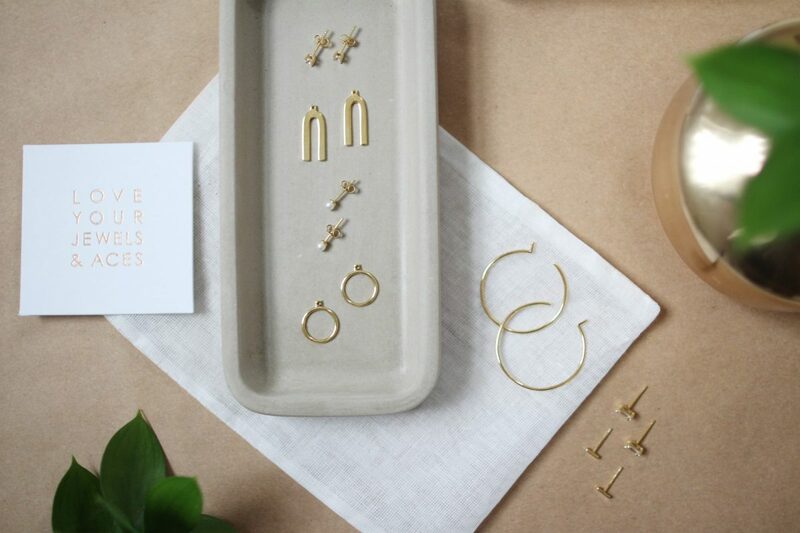 Wonderful post, I love that the earrings are interchangeable, which sparks personal creativity!